This cover is way better than my copy! This is such an important book to have in classroom libraries right now. It tells the story of friendship between Marlee, a shy white girl, and Liz, a black girl who gets caught "passing" as white at school. This is just one of the tensions in Little Rock in 1958, the year after the Little Rock Nine integrated schools. I had no idea that the public high schools were closed for a year in order to prevent integration. I was charmed by Marlee, who is truly naive, but grows more vocal and brave throughout the book. I also liked that many of the 'villains' showed their humanity. I want young readers to discuss what overt racism looked like and learn to fight against it, especially with how often it occurred in this past election cycle. It would be a good talking point for how ugly it is in the book, and that hate speech is equally as ugly on social media. 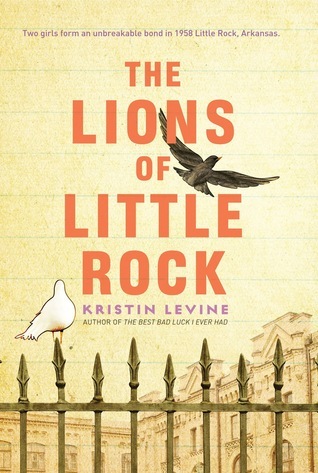 Things wrap up nicely in The Lions of Little Rock, which makes it middle grade-friendly. 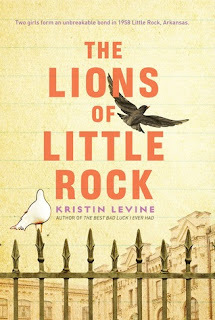 I appreciate author Kristin Levine's research and will be eagerly book-talking this title.